After Hurricane Maria, the island of Puerto Rico has struggled to regain strength in its infrastructure, economic independence and most importantly, healthcare access. It is a right of the people to receive health options that provide long term benefits and healing in their hearts and minds. The people who suffer the most are located in rural areas within the interior of the island; however the whole island must be restored to health both physically and mentally. We know that healthy people can contribute greatly to rebuilding efforts, a sustainable economy, and local business to help rebuild the communities and infrastructure of Puerto Rico. 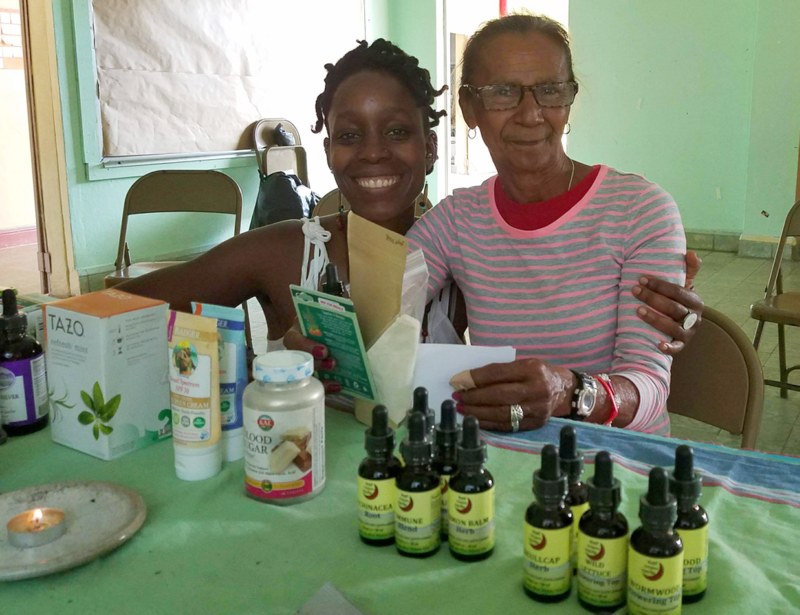 The Keepers of Herbal Traditions works to provide immediate holistic care through weekly mobile clinics providing herbal and nutritional consultations throughout the island. We also serve by offering long term strategies and interventions to increase wellness and wellbeing via holistic health and nutrition education. We are working to offer professional training and workshops to interested groups to learn community herbalism and medicinal plant growing as a benefit for self and family care in our communities. We hope to expand our clinic to meet the needs of community visiting various parts of the island every week. KHT works with town officials to organize clinics in public locations such as schools or community housing projects where needs are greatest. In the same vein, work with interested community members in training herbalism and growing medicinal gardens for nutrition and herbal benefits. At the moment we are working with El Projecto Guatiaos, via a bi-monthly visit to the city of Jayuya where we set up in a community project organized for us by the Mayor. We see about 20 to 30 clients a day, predominantly women, children, & then finally, men. Age groups vary, but our primary audience is adults 22-70. Most seek holistic wellness support for depression, inflammatory issues, diabetes type 2, gastritis, high blood pressure, and anxiety. We also work to support reproductive health, maternal and child wellness & education, and women's support. This model is very important in Puerto Rico, as access to maternity care or western medicine is very limited, particularly in rural communities. Our clinic is well received - once we see one person, we often see family members & friends referred to us on our next visit. We have also offered seeds to the community to grow nutritious organic foods and medicinal gardens. HWB Puerto Rico would like to teach them how to harvest and use medicinal herbs. This clinic is ongoing and needs monthly supplies and herbals. Supply needs include containers, bottles of various sizes, baggies, labels, tea strainers, herbal medicines such as bulk herb access, tincture making supplies such as glycerine and alcohol, beeswax, medicine making tools; grinder, mortar and pestle, hot plate, refrigerator, bowls, jars, whisk, spatulas, wooden spoons etc. Carriers: carrier oils that are stable in a warm environment, as well as herb infused carrier oils that we can blend for specific uses. Supplies: 1 oz bottles with droppers, 2 oz bottles with droppers, 1, 2, and 4 oz flip top containers, baggies, reusable tea strainers, compostable empty tea bags, glycerine, beeswax, grinder, mortar & pestle, hot plate, refrigerator, bowls, jars, whisk, spatulas, spoons, measuring pyrex, measuring cups, portable scales, anything to support an herbal clinic! Put "Puerto Rico" in the comment area to earmark donations straight to the support & relief in PR. Thank you! ​We accept donations for the Puerto Rico clinic at our main HWB headquarters. We store all supplies and ship supplies needed regularly to Puerto Rico. Please be sure to send good quality herbs, extracts, supplies, salves. We are unable to accept items that are not properly labeled, or any capsules, salves or liquid formulas that have already been opened/used. Thank you. Are you interested in volunteering or supporting this project? Are you interested in becoming a benefactor or donor for Puerto Rico? Email our office!